As it turns out, you can judge this book by its cover – and let’s just take a moment to appreciate the fantastic cover art. 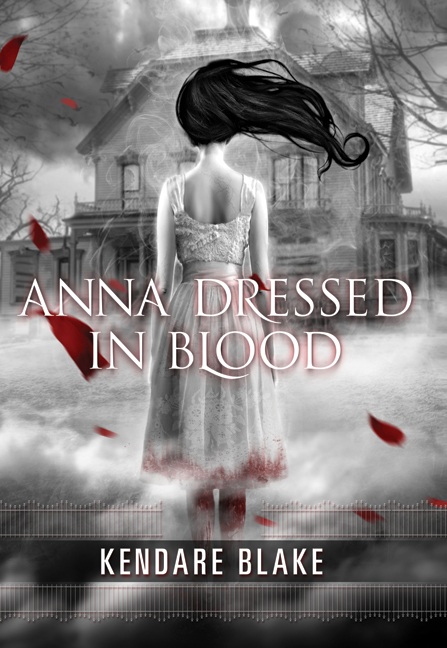 Honestly, it was the cover that reeled me in and I am so very glad that it did, because Anna Dressed in Blood is an all around lovely surprise – gory and sweet, chilling and fun, and yes, even romantic. Fresh and scary, this book kept me glued, cover to cover, and delivered on every front. I could go and try to insta-bond with the lead jock, I suppose, but I’ve never been good at that. My Dad and I never watched sports or played catch. I can wrestle the dead all day long, but touch football might knock me unconscious. Girls, on the other hand, have always come easy. I don’t know why that is, exactly. Maybe it’s the outsider vibe and a well-placed brooding look. And that humor is so very, very necessary in a horror story, because it’s what gets us through the dark and disturbing parts – and oh, does this book ever have dark and disturbing parts! A horror story from the classic Gothic ghost story school, Anna Dressed In Blood is definitely not afraid to spook you – and this book got me good. I like to think I’m pretty tough when it comes to gore and mangling – hey, I watch Bones – but this book genuinely sent a frisson up my spine, and got my gut a-churning. Blake manages to perfectly balance taut and creepy with engrossing, and like a fish on a hook, this story will well and truly reel you in. I wouldn’t even particularly call myself a horror fan, and I enjoyed every minute of it. But never fear, this book isn’t only about dark things that go bump in the night – there is a genuinely sweet side to this story. There is a romance, and frankly it’s adorably genuine – not to mention Blake brings a deft touch of originality to the proceedings. Let’s just say it’s a romance that is very easy to fall in love with. I also very much enjoyed Cas’ relationship with his Mom – it was what hooked me into his character from the start, and it also really grounded the story for me. It’s lovely to have a parental figure be in on the paranormal secrets and shenanigans, and part of the story for a change. Cas’ Mom was largely on the sidelines of what was going on, but she made her presence felt in a good way. There is nothing not to like about Anna Dressed In Blood – it has heart, soul, and blood. If you’re suffering from paranormal YA fatigue – if a girl being “inexplicably drawn” to a dark and brooding boy makes you want to bang your head against a wall – this is exactly the book you need. Abundantly original, marvelously inventive and enormous fun, this can stand alongside the best horror fiction out there. We demand sequels. There was a great mix of everything in this book from the witchcraft, romance, blood & gore, to the sarcastic humor from Cas, that had me laughing out loud from time to time. Anna Dressed In Blood is one of a kind and could very well be a stand alone book, no extreme cliffhanger at the end. Read this one for sure… Only if you have a strong stomach! I was won over by the characters, blown away by the plot and enchanted by the progression. I did not expect this novel…Anna Dressed In Blood needs to be experienced and Ms. Blake needs to hurry up and write more because I am hooked and I need my next fix.